This whiskey is a core bourbon of the Jim Beam small batch collection, which also includes Knob Creek Single Barrel, Knob Creek Rye, Booker’s, Basil Hayden’s, and Baker’s – and this whiskey is the oldest of the lot at 9 years old. However, as we are seeing with many bourbons, this age statement is now gone although in Ontario we still have age-statement versions of this whiskey kicking around. This is the old 9 year version that is reviewed. A small batch whisky means that the whiskey is composed of batches which have a smaller number of barrels (typically of higher grade whiskey) produced in a smaller quantity than the typical higher volume products, though I’m sure a “small” batch at Jim Beam is not that small. 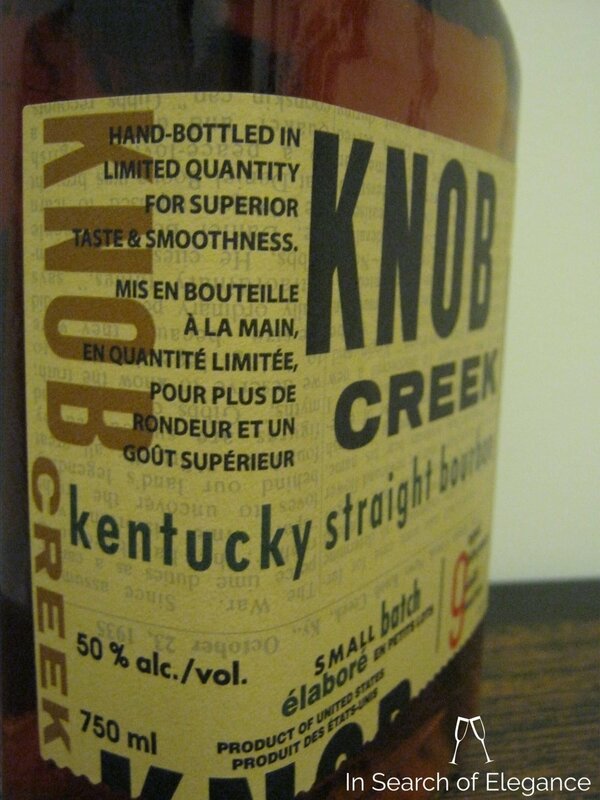 The whiskey is named after Knob Creek, which was the home of Abraham Lincoln when he was growing up. The bottle itself is a tribute to old smugglers who used square bottles so that they could be more efficiently packed, and the newspaper label is another tribute as the smuggles used to put newspaper between the bottles to stop the clinking. Nose: Light and floral rye influences sit above some more hefty maple, oak, potato, flambeed banana, and corn husks. The nose, I find, is a touch yeasty – as I often find with bourbons. It smells quite sweet, and has fruitiness in the “stone fruit” category – cherries, peaches, as well as some fruity and nutty notes like apple seeds. Vanilla just leaps out if you let it sit a bit. Taste: Lots of corn upfront, with the fruit – cherries, apples, and peaches – coming in the middle before oak and spices take the finish. In that sense, the palate is controlled and has movement – which I quite like – and it leads into the finish well. 50% ABV also seems to fit this bourbon – it is about right, without water, and it’s not very hot. Very easy to drink – it balances the sweetness and the spice nicely, with good body and complexity. Finish: Corn, with a background of oak and light smoke – and nutmeg, cloves, peaches, and apple seeds. Slightly drying with the tannins, and quite sweet – but enjoyable, with decent length. Very drinkable – at times a bit simple but it is balanced and rich with a good assortment of flavours. It may come off as a bit sweet to some, but I certainly don’t have any trouble with this. It is, also, a favorite mixing bourbon of many well-established cocktail bars for good reason. Value: Very High. Great price for what you get.